Allah, AL-MUQSIT, Praise and Glory be to Him, isthe EQUITABLE Who is Just in His judgments. The Qur’an denotes that in,“Say, my Lord hath commanded justice” (A‘RAF,29), “..and be fair, for God loves those who are fair andjust” (HUJURAT, 9); Allah, Glory beto Him, says, “ So establish weight with justice” (RAHMAN, 9), “Call them by the names of their fathers,that is juster in the sight of God” (AHZAB, 5). Allah, the EQUITABLE, takes revenge from the oppressive, wards off the tyrants’ oppression and lets the oppressed triumph over thetyrants; He acts justly and removes all sorts of inequity. One of themost significant of the Divine Secrets is Allah’s Forbearance intreating the oppressive while gratifying the oppressed. The Muslim may act unjustly unawares, he may repent without finding a way to right his evil deed; on Doomsday he will stand beside the person to whom he was unjust in front of Allah, the EQUITABLE, Who would satisfy the oppressed and may forgive the unjust; no one can do that except Allah, the truly EQUITABLE. 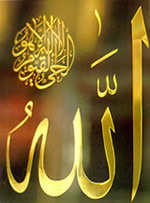 An episode was related by Omar Ibn Al-Khattab that Prophet Muhammad, Allah’s Prayers and Peace be upon him, was sitting with his Companions, he laughed till his front teeth appeared, so Omarsaid “I sacrifice my father and mother for you, O Messenger of Allahwhat has made you laugh?” The Prophet, Allah’s Prayers andPeace be upon him, said, “Two men from my peopleknelt before Allah, the Lord of Glory, the first man says ‘Oh myLord! Avenge me on that man.’ So Allah, Praise and Glory be to Him,says to the second man ‘Give to your brother all what you unjustly tookfrom him!’ so the man says ‘O my Lord! I have nothing left of my good deeds.’Allah, the Lord of Glory, says to the first man ‘What shall you do withyour brother? Nothing is left to him of his good deeds?’ so the man says,‘O my Lord! let him bear some of my sins and be punished for them insteadof me.’”, then the Prophet, Allah’s Prayersand Peace be upon him, had tears in his eyes and said, “Thatwill be a Great day when people will need someone to bear their sins”,then he said, “Then Allah, Praise and Glory be toHim, will say to the oppressed ‘Raise your eyes and have a look at Paradise!’the man says ‘Oh my Lord! I can see cities of silver and palaces made ofgold and studded with pearls. Who is the Prophet to whom all this will begranted, who is the righteous who will have all this, or who is the martyrwho will have these things?’ So Allah, Praise and Glory be to Him,says ‘ALL this will be granted to the one who can pay for it’. So the oppressedasks ‘And who can pay for it?’ Allah says ‘You can’, so he says ‘How,my Lord?’ Allah, Praise and Glory be to Him, says ‘By forgiving yourbrother’. The man says ‘O my Lord! I forgive him’. So Allah says ‘Takeyour brother’s hand and let him enter Paradise’ ”. Then the Prophet,Allah’s Prayers and Peace be upon him, said, “FearAllah and promote accord between yourselves, for Allah will make yourrelations on Doomsday whole and sound?” (HADITH). The Prophet, Allah’s Prayers and Peace be upon him, says, “Allah, Praise and Glory be to Him, says, ‘If you pray that someone is punished because of his injustice to you,and another one prays that you are punished because of your injustice tohim; if you want, We will answer both prayers, else We will delay both ofyou till Doomsday when My Forbearance will overwhelm you all’.” (HADITH). Praise and Glory be to the Most Forbearing, the EQUITABLE, He is Allah. «(85) The MASTER of MAJESTY and HONOUR (ZOUL-JALAL..